The Series AFR2 Instrument Filter Regulators provide clean air pressure to pneumatic controllers, valve positioners, air cylinders and other equipment. 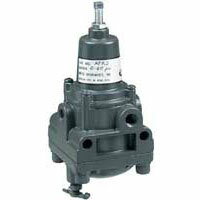 Self-relieving regulator is equipped with a 5 micron filter housed in a dripwell with gage port. Body: Aluminum or SS; Filter: Polyethylene; Diaphragm and valve seat plug: Nitrile elastomer. 1.7 lb (0.6 kg), SS models: 3.0 lb (1.4 kg).